I have never been a fan of PowerPoint, Slides or any other teacher-dominated presentations in the classroom. These are great tools for certain audiences, and I do use them when presenting at conferences and when speaking as an advocate for Asperger’s Syndrome. However, I have never used the “lecture and present” format as a classroom teacher. In my opinion, this overused, instructional tool destroys classroom dialogue, and the “pre-packaging” of information prevents higher level thinking and reading skills that students need to develop. That being said, teacher-driven presentations are still the preferred instructional method for many teachers, so I am always on the hunt for ways to make them better for the victims….errrr….students. So, it is with great delight that I share the good news: Google has added some collaborative elements to Slides! On “May the 4th be with you day”, Google announced changes to Slides that are definitely a force to be reckoned with. Now the presenter can share a short link that allows the audience to ask questions as the presentation is ongoing. These questions can also be voted on by others, enabling the presenter to hone in on and answer those questions of greatest interest or concern. WOW! This is a game changer! The back-channeling of questions is now part of the record in Google Slides, the audience is interacting with the ongoing presentation in live-time and the audience members are even interacting with one another by voting on posted questions. 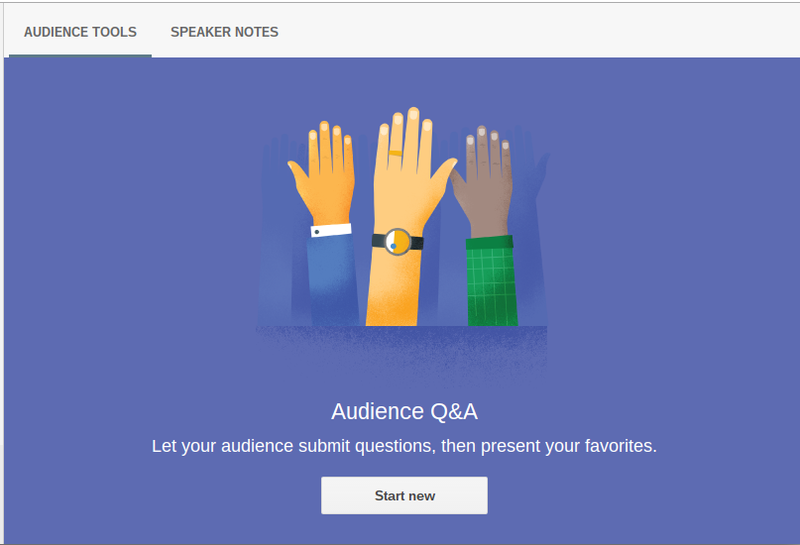 Now, teachers, let’s get those classroom presentation in the cloud, convert them to Google Slides, and get busy involving students in the questioning and learning process! P.S.–if you start using Slides, they have a cool, new laser pointer to use as you present! !